Running is a calorie-burning workout that can tone your legs and buttocks. While there are many benefits to running, there are some common drawbacks--back pain, knee inflammation and foot problems. If you experience pain after every running session, it's time to take pain-preventing steps that help you avoid overuse injuries and painful symptoms. 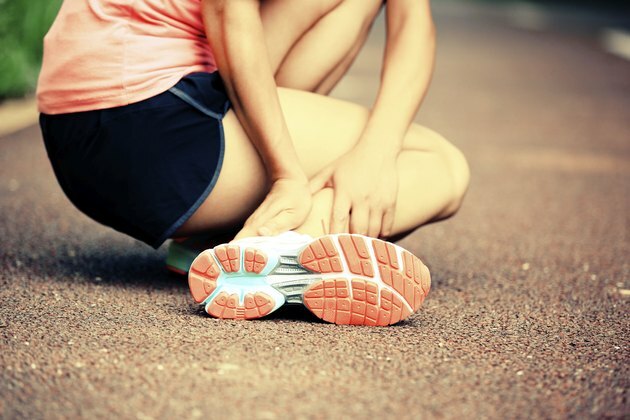 Your anti-pain running plan should address the common injuries runners experience including tendinitis, shin splints, runner's knee and lower back pain. Purchase new, supportive shoes designed specifically for running. Many common running injuries stem from a lack of shock-absorbing shoes to cushion some of the impact running places on your joints. Replacing your shoes with lightweight, durable running shoes can stop pain. If you run outdoors, your running shoes should feature grips that prevent you from slipping on the ground. Remember to replace your shoes every 300 to 500 miles you run, according to TheRunnersGuide.com. Run on a surface that cushions your joints, like a rubber track, grass or a quality treadmill that absorbs impact. Hard surfaces like cement can be too hard on your joints, causing pain when you run. Sand also should be avoided if possible because sand can create an uneven surface that increases your risk for Achilles tendon injury. Warm up before you stretch. Some runners do the opposite. However, you should walk or lightly jog for three to five minutes to warm the muscles before stretching them. This can improve how deeply you are able to stretch, reducing your injury risk. Stretch all of the muscles you use when running -- including your quadriceps and calf muscles, two common injury sites. Incorporate an iliotibial band stretch into your routine to prevent iliotibial band syndrome, a common runner's injury that causes pain on the outer portion of the knee. Cross your right leg over your left and reach for your toes and hold the stretch for 30 seconds. Release, then repeat the stretch on your opposite side. Rest your running muscles by cross training. This is especially important if you run more than 40 miles per week, which makes you more prone to knee injuries, according to Cool Running. Substitute one of your weekly running sessions with biking or swimming to challenge your muscles in a different way and prevent overuse injuries. These are low-impact exercises that place fewer demands on the joints than running. Strength train three days per week to boost muscle strength in the legs, which can stabilize your joints and prevent injuries and pain. Lunges, squats and calf raises can be helpful in preventing these injury types. Stay hydrated. Lost water and salts during exercise can throw off your body's internal balance, contributing to pain and injury. Weigh yourself before and after running. Drink two cups of water for every pound you lost while exercising. Cool down by slowing your running pace to decrease your heart rate. Stretch the muscles you just worked. This can cut down on residual muscle stiffness and pain following a running session. If you take steps to address this pain, yet still experience difficulties, see a physician who can determine if you have incurred a more serious injury.